This woman’s parka is made of 50 eider duck skins, with the feathered sides turned inward for warmth. Aleutian fur and birdskin parkas do not have hoods. This one is finished with a black cloth collar, decorative bands of red paint, and sealskin trim. Vlass Shabolin: It’s got feathers on the inside to keep it insulated. Mary Bourdukofsky: But they used to wear it outside too. Aron Crowell: Do you think it would have been worn with the feathers on the inside like this? Maria Turnpaugh: For the rain they’d wear them with the feathers on the outside. Vlass Shabolin: With the feathers out, the rain will just slide right off the feathers. Aron Crowell: Do you think this would be a women’s garment? Maria Turnpaugh: I think so, because in everything I’ve read about this, women wore them. This collar here you see on women’s garments. Aron Crowell: Would this most likely be a cold-weather garment? Mary Bourdukofsky: Wet season maybe. If it was cold weather thing, it would be fur. Maria Turnpaugh: Well, they’d wear this on the inside of it. Vlass Shabolin: They could wear something like this year round. Aron Crowell: How about the Unangax^ name for a parka like this? Mary Bourdukofsky: Ug^kain [feathers]. Sox^achathamug^kain [bird feathers]. When it’s all done, maybe it’s named sux like she says. Daria Dirks: Then what is this on top here [parka body]? Mary Bourdukofsky: That’s the skin of a bird, mostly the breasts. I think they could use the back too. These are winter eider ducks. Vlass Shabolin: Yes, this is the skin off the female King Eiders, what they call Common Eiders. They’re pretty big. Aron Crowell: You can see the backs of each skin. Daria Dirks: How many would they have to do to get this much? Aron Crowell: And what about the trim on the cuffs? Maria Turnpaugh: Well, this is kind of spotty. Mary Bourdukofsky: Yes, see the spots—blonde and dark. Vlass Shabolin: When you treat the hair seal hide, it does become golden. Mary Bourdukofsky: Yes, it’s a hair seal. Maria Turnpaugh: And the stiffness is hair seal. Aron Crowell: And is it sewn with sinew thread? Mary Bourdukofsky: Yes, really fine. Aron Crowell: Is that painting along the hem? Aron Crowell: What is the collar? Maria Turnpaugh: It looks like wool material and on the inside is some kind of a cotton print. Vlass Shabolin: Mary, uux^hee [stripping bird feathers]. Mary Bourdukofsky: Yes, they skin them. Vlass Shabolin: They peel them right off the bird—the whole thing will come off. Then they split it, and then they cut it even after they dry it up. Mary Bourdukofsky: They put pieces together. Daria Dirks: Look at the perfect sewing. Aron Crowell: How would these skins have been prepared? Maria Turnpaugh: They dry them. Mary Bourdukofsky: They wash them real good first to make sure all the meat and blubber is off, and then they dry. You had to stretch it, just like any other skin, to dry it. And when you skin it, they’re not even. Some pieces tear and come off, and you could tell that they pieced these to make it. Mary Bourdukofsky: Yes, one square. Aron Crowell: So where they’re not cut square, they’re joined to make an even row? 1. According to the Aleut dictionary: Unangam Tunudgusii, sa-x means “birdskin parka” in the Eastern Aleut dialect (Bergsland1994). Mary Bourdukofsky confirmed that sax would be the name for this. 2. Hair seals—also called true seals—refer to various types of earless seals (family phocidae) including harbor seals, bearded seals, ribbon seals, spotted seals and ring seals—excluding fur seals (an eared seal). 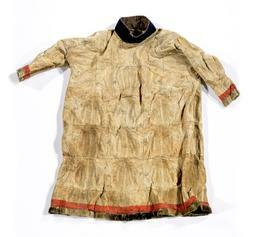 The parka for Aleuts in the local climate is an indispensable article. On the road, it constitutes their bed and blanket and, one might say, home. With it they are not afraid either of wind or cold. Aleutian Islands parkas, once an essential resource for everyday life and survival, are now made primarily for contemporary dance performances. (2) The traditional parkas were long (extending to the ankles) and straight across the bottom, with stiff standing collars and no hoods. (3) When explorers and fur traders first arrived in the 17th century they recorded that men’s parkas were sewn from bird skins while the women’s were usually made from fur seal or sea otter. (4) Under Russian rule these furs were deemed too valuable for use in clothing, so women sewed their parkas from birds or spotted seal skins. (5) In the eastern Aleutians, trade with the Alaska mainland meant that bear, caribou, marmot, and arctic ground squirrel skins were also available. Birdskin parkas were reversible. The feathers were turned inside for warmth during cold, dry weather and outward when it was warm or rainy. (11) The skins were stitched with the birds’ heads facing upward so that their feathers easily shed water. (12) When at sea, men wore birdskin parkas beneath their seal intestine raincoats. This eider duck parka from the National Museum of Natural History has its feathers turned to the inside. It has a standing collar of black wool cloth, red painted bands at the hem and cuffs, and trimmings of spotted seal fur.